Rolf Kenneth: The book "According to Martinus"
The book has 160 pp., with ten symbols in colors and some mugshots. Until it get published it will be privately printed. NOK 350, postage included. Last updated: December 2008. Is the primary dimension of existence spiritual or material? This is the big question, in fact the most basic question that science, religion and philosophy should take a stand on. And it is a question that each and everyone of us consciously or unconsciously takes a stand on when we develop our personal life strategy. If the primary dimension of existence is spiritual, then we live in a meaningful universe where life is an exciting adventure; an adventure where bliss and not depression is awaiting those who dare to dive deeply enough into the mysteries of life. If the primary dimension of life is material, then we live in a meaningless universe where coincidences and physical laws rule. The life strategy for most people, then, will be to grab as much of the �pie� as possible as tomorrow it may be too late. With a materialistic outlook, most people choose to pursue superficial and sensuous pleasures. In such a world, what else is offered other than emptiness, death and transience? The publishing of Darwin�s The Origin of Species (1859) changed mankind�s basic academic outlook from spiritual to materialistic. Has our spiritual outlook then been nothing but na�ve and childish faith, whereas the academics� materialistic outlook is based on a solid scientific foundation? Surely, this is what the scientists themselves like to believe. Are the academics and materia­listic scientists wrong? The short answer is: Yes, abso­lutely! It is easy to point to where and when in the history of science that the academics started heading in the wrong direction. Ever since, they have not managed to get out of this blind alley where only the measurable (quantitative) aspects of existence are subject to research. We will return to this later. Prerational understanding, inviting a magical-mythic shaped spiritual outlook. This level of understanding we find in children and primitive people. Rational understanding, inviting a materialistic-logical outlook. This level of understanding dominates in adults and in today�s mainstream culture. A materialistic outlook can be the source of various value-based attitudes, such as humanism, egoism, consumerism and nihilism. 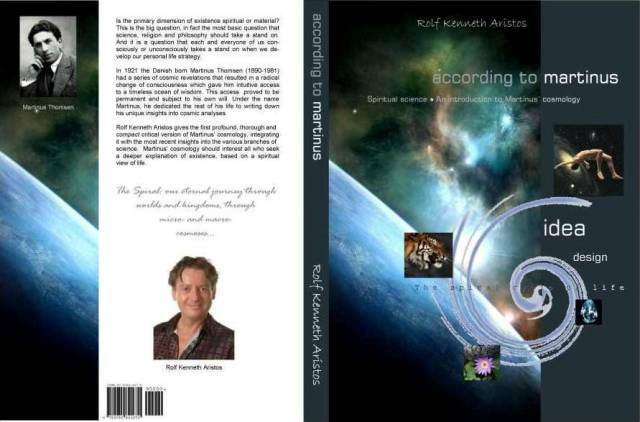 Transrational understanding, inviting an intuitive based spiritual outlook. This level of understanding is far beyond the magical-mythic or the materialistic perception of the world. This level of understanding looks at the world as states of consciousness and physical-materialistic crystallisations thereof. The spiritual world is experienced directly. This evolutionary model has two interesting points. One is that rational under­standing is a step forward from a prerational understanding, even though the rational understanding leads us astray towards a materia­listic outlook. The other is that man�s evolution doesn�t stop at the rational level, but moves on to a transrational understanding which returns the spiritual outlook on a much higher level. Our world, and the East in particular, has always had spiritual traditions based on transrational understanding. Examples are the original forms of yoga, zen and tantra, as well as the mystical-meditative branches within the conventional religions, as well as the esoteric (�for the initiated�) cosmo­logies. These spiritual traditions also have their smaller and greater disagreements and differences in interpretation. But also at this high level we find an evolution going on, and an exciting evolution! It is from this perspective that we shall consider Martinus� cosmology. We ask: Is Martinus� cosmology the intuitive flower of the mystical traditions and the esoteric cosmologies that so far have enriched our cultures? Does Martinus� cosmology represent the type of spiritual outlook that more and more of us head towards, as we in a natural and organic way outgrow the prerational religions and rational scientism? Martinus Thomsen (1890-1981) grew up with his foster parents on a small­holding in the outskirts of the small station town Sindal in northern Denmark. As a twelve-year old he started earning money as a shepherd on neighbouring farms and continued to work as a shepherd until he was eighteen. He then got his first position at a dairy and over the next ten years worked for eight dairies. His hobbies were photography and conjuring tricks. He was sensitive, good-natured and always quick to laugh. His great ideal was Christ and from childhood he felt the divine dimension behind nature. But he found Christian doctrines intolerant and unsatisfactory. When Martinus was thirty he was encouraged by a friend one day to try meditating. He settled comfortably in his wicker chair, tied a scarf around his eyes and started meditating upon the concept of God. He experienced a marvellous revelation where the universe showed itself as a manifestation of the divine. When he meditated the following day, he was elevated to the highest sphere of eternity and all-lovingness. The two revelations resulted in a radically changed consciousness that proved to be permanent. Martinus� new state of conscious­ness had many qualities in common with the East�s state of awakening (samadhi; Buddha-consciousness), but with the difference that Martinus also gained access to a unique intuitive ability with which he could penetrate the mysteries of existence. Microcosm and macrocosm, the distant past and future; with his new extraordinary ability nothing was hidden. Martinus saw his own past and he understood (or regained his memory of) what his mission on Earth was. He had come here to complete what earlier world teachers could only allow themselves to hint at through parables and words of wisdom. Now was the time when humanity was ready to receive the truth, for the first time, in the form of complete cosmic analyses. Martinus dedicated the rest of his life to writing articles and books, and to establishing the institutional foundation for spreading his teachings and literature worldwide. His main work is Livets Bog (Book of Life) I-VII of 2800 pages. He chose to give his collected works the collective title The Third Testament. From the 1960s onwards, Martinus was given considerable intellectual assistance from his student Per Bruus-Jensen, whose main work is the four-volume work �X�: a complete introduction to Martinus� cosmology [not translated]. In the works of Bruus-Jensen the reader finds useful material that Martinus did not include in his own books. For Martinus it was essential to convey how love and bliss constitute Existence�s deepest dimension and message, and to inspire us to pay more attention to the ethical dimensions in everyday life. To Martinus all beings are immortal; we are all part of eternity. Life is an adventurous journey through an infinite spiral made up of six kingdoms and seven cosmic levels that repeat themselves octavewise. A mighty �contrast-principle� makes sure that the journey of life always is experienced as �here and now for the very first time�. Martinus had read very little literature before he started his own writing and after his �cosmic birth� he felt an inner resistance in the form of sensations of blasting whenever he tried to open a book. The result of this �cultural virginity� is that his cosmic analyses are not influenced or �sullied� by book knowledge. Nobody can claim that Martinus� cosmology is a synthesis, integration or eclectisism of components from other spiritual systems. However, this cultural virginity has had its price. Martinus expressed himself in a clumsy way on paper, and what he wrote could have been far better structured. And his books contain few references to philosophy or science or to religious or spiritual traditions. When studying Martinus� cosmology, we gradually become aware of what kind of infrastructure we should expect as a minimum of a modern spiritual cosmology. And, having studied Martinus� cosmology for some years, whether we find him convincing or not, it is something of a cold shower to return to the esoteric traditions of the East and the West. For the first time we realise the enormous shortcomings, holes and deficiencies in these systems. It is as if the East�s wisdom of awakening and the West�s theosophy and anthroposophy are, compared to Martinus� cosmology, nothing but �cosmic glimpses�. The book you are holding has several purposes. Firstly, it is meant to be an introduction to Martinus and Per Bruus-Jensen�s own works. Secondly, it is a continuation of Bruus-Jensen�s ambition to bridge the gap between Martinus� cosmology and science. Thirdly, it offers a critical view on Martinus� literature and certain points of his teaching. In cases where I agree with scientific or occult research deviating from Martinus� own teaching, I make this explicit. The book starts with presenting Martinus� cosmology, and ends with a thorough biographical chapter.